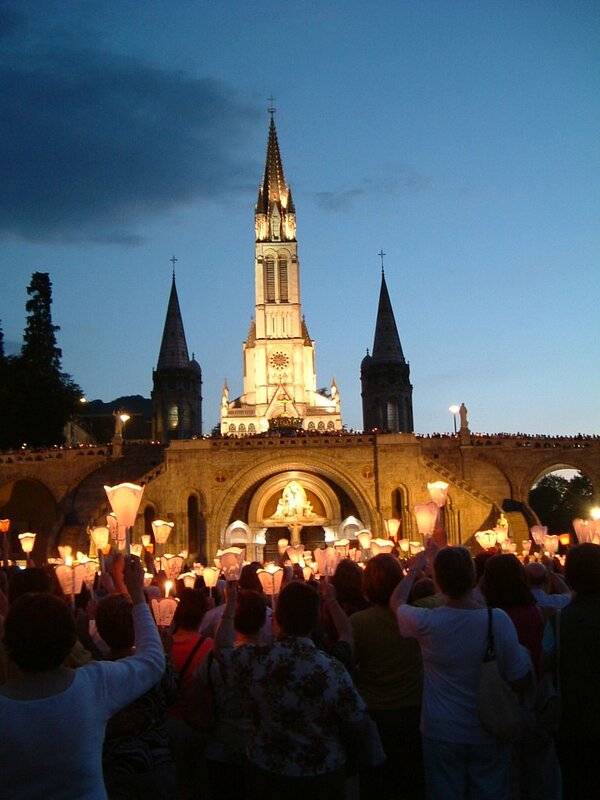 The most distinctive part of the experience of Lourdes is the nightly torchlight procession. This begins at 9pm. As France is an hour ahead of England, it is still light. During the hour or so of the procession, the sun sets and night falls. 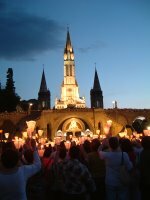 The picture to the left is taken from the Breton Calvary at the end of the Esplanade as we turn to go back down towards the Rosary Basilica. During the Procession, the Rosary is said. The Our Father is sung in Latin at the beginning of each decade, then the Hail Marys are said in different languages, usually five Hail Marys per language. In our Pilgrim Booklet this year we printed the texts in French, Spanish, German, Italian and Dutch. (Next year, I think we must add Portugese, Polish and Gaelic.) Then the Gloria is sung in Latin. In between each decade, there is a hymn or chant. 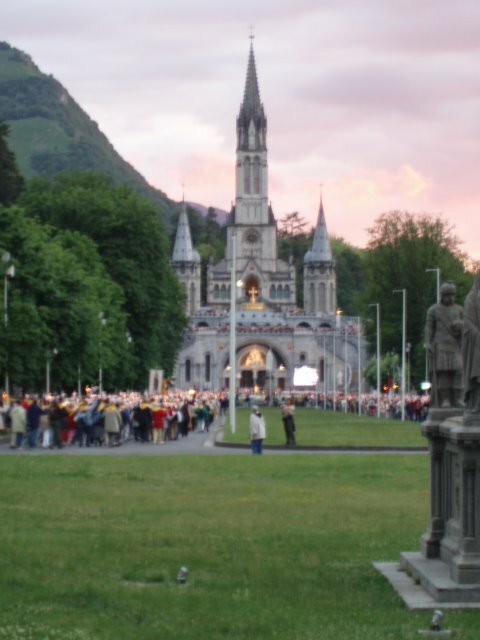 The first is always the traditional Lourdes Hymn. At the Ave, everyone holds their candle up. At the square in front of the Basilica, the procession is directed by the brancardiers to zig-zag while wheelchairs and flags are directed to the front. By this time, it is dark and the raising of the torches becomes more dramatic. When the Rosary finishes, one of the Bishops present gives a pontifical blessing. The evening finishes with a multi-lingual invitation to exchange a sign of peace. As a devotion in the spirit of European post-war fraternité, I have to say that this actually works quite well. Then off to the grotto for a night visit or back to the hotel for a nightcap and to exchange experiences of the day.